Citation Information: J Clin Invest. 2006;116(3):556-560. https://doi.org/10.1172/JCI27913. Domain structure of nuclear receptors. N and C represent the amino and carboxyl termini, respectively. AF1 is a variable amino-terminal transactivation domain. 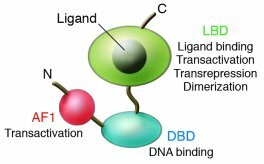 The ligand-binding domain (LBD) also mediates dimerization, transcriptional activation, and transcriptional repression functions. DBD, DNA-binding domain.